it's our new, howlingly ambitious Viridian Design Contest. Global Business Network are professional futurists. Based in Emeryville, California with colleagues and clients scattered worldwide, GBN are future wonks nonpareil. GBN has always been interested in Viridian activism, and GBN has now ventured to commission their own Viridian Design Contest. This is gonna get pretty good, folks. As commercial futurati, GBN likes to throw seminars called "learning journeys." They involve tours of companies and production facilities, and presentations by "GBN Interesting People" such as myself, Laurie Anderson, Brian Eno, and even more advanced thinkers (if such a thing is even possible). Then there are futurist scenarios. If you ever wondered why most science fiction novelists write Galactic Empire trilogies, while Bruce Sterling writes dense, spooky, complicated books in which political campaign advisors have love affairs in Louisiana with federal neuroscientists, well, suffice it to say that Global Business Network has intellectual influence. They were Global way before global was cool. The next GBN event, starting in California in early October, is "BIOFUTURES: An Introduction to the Science, Technology and Business of Biotech." In this case, we Viridians will be an object lesson. We will be teaching GBN's astonished clients how we Viridians speculate about advanced biotech consumerism in a Viridian design context. And GBN's attendees – venture-capital types, generally, with the occasional policy wonk or bent academic – will be the JUDGES of this contest. These people wear nice suits. They sign big checks. They start-up high-tech companies. If they send you email and hire you, don't say you weren't warned. "Okay," I hear you asking. "A Viridian design gig with corporate futurist sponsorship. What's in it for me?" Great question, sir, ma'am! The astounding prize in this Viridian Contest is – a Sony Aibo Robot Dog! That's right! It's an actual, no-kidding, commercially available, sort of alive, robofuturistic, adorable personal companion, just for you. Tina Estes, our GBN/Viridian Spokesmodel, has just broken that baby out of the styrofoam blocks. She'll insert some batteries into its entrails and make sure it's not a factory lemon. Then you get to take it home and KEEP IT! 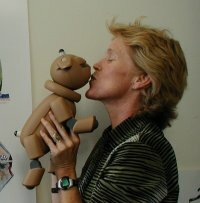 Just imagine the stunned surprise, not to say uncanny Frankenstein alarm, when your own no-kidding cute brown bulldog-oid 2002 A.D. Sony AIBO ERS-31L comes into your room to greet your friends, frolicking and blinking and, eerily, digitally photographing any object it finds of interest. Listen up, Australians, Europeans, South Americans, Asians. Global Business Network is a global network. They'll cheerfully ship that expensive, complicated robot anywhere on the planet. Interested? Good! Because the Sony Aibo ERS-31L robot entertainment unit, praiseworthy as he-she-or-it is, is a mere shadow of our designer expectations. 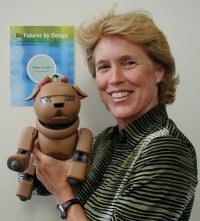 For this Biofuture Robot Dog Contest, we want you to imagine and design a similar but vastly more advanced doglike entity, which has nothing to do with the Sony corporation or their copyright lawyers. This is no mere cyberdog device of period plastic, iron and silicon. This is a biofuturistic, green, way out-there ribo-bio-bamboo "dog", which is transorganic, biomimetic, Viridian, enzymatically postindustrial, and tissue-engineered. Don't pretend that you are replacing a real dog. That effort is useless, and even the "robot entertainer" Aibo doesn't do that. This is a roughly dog-shaped bio-entity. It needs to enter some commercial and cultural space which actual dogs and contemporary robots cannot reach. What does a biofuturist paradog do for tomorrow's consumer? What kind of society buys these gizmos? Why do people make them, what are they for, what kind of future world would support this device? Try to suggest some convincing answers – answers that can snow real live venture capitalists! And it's a toy. That's of vital importance. The target is the age 9-12 demographic. It's not for war, terror, prison, or home security, tasty though those sinister applications may be. We want parents buying this. It needs to jump right off the shelf and into their loving arms. Instructions need to be understandable by the average 10-year-old. Parents will appropriate disclaimers and assembly guides. And don't forget the exquisite ecological awareness! We are looking for a child-friendly guide-dog to a greener biofuture, with biosensors, industrial biotech, the reduced ecological footprint of a new bioeconomy, bioenergy sources, and so forth. Although I am not going, I'm paid nothing, and I'm not judging this contest, I do have some briefing papers for the upcoming GBN event here. These suggestive excerpts may help nudge you into the proper design space. Bioelectronics, biomaterials, enzymatic engineering, agrobiotech, environmental bioremediation, and strange things to do with tissuelike substances: these are the topics your Contest Judges will be studying at their event this October. Present this in appropriate lingo, get under their imaginative skin, and you, Viridian Designer, are gonna be walkin' the robot dog. This contest ends September 30, 2002. Replace industrial manufacturing with room-temperature enzymatic sustainable processes. No acids, phosphorous, or hazardous metal wastes... enzymes have evolved to catalyze chemical reactions at blood heat while the typical industrial equivalent might require several thousand degrees Centigrade. Enzymes such as lipases, proteases, cullulases and amylases are substituted for noxious high-energy industrial chemistry. Environmentally friendly, highly efficient and cost-effective. Crops reengineered for greater ranges of environmental conditions, temperature and moisture extremes... Molecular tuning of oils, fats, proteins and carbohydrates, alterations in leaf, petal, stem, branch, root and seed structure, modified breeding and growth cycles. Focused on the construction of new tissues and organs as replacement parts for diseased and aging body parts. Using the skill and knowledge of cell biologists, molecular biologists, biomaterial engineers and CAD designers, tissue engineers have set out to grow liver, bone, muscle, cartilage, heart muscles and pancreatic tissues.